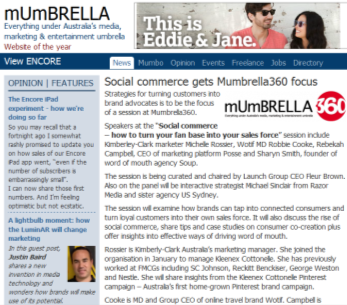 Social commerce gets Mumbrella360 focus. Strategies for turning customers into brand advocates is to be the focus of a session at Mumbrella360. Speakers at the “Social commerce – how to turn your fan base into your sales force” session include Kimberly-Clark marketer Michelle Rossier, Wotif MD Robbie Cooke, Rebekah Campbell, CEO of marketing platform Posse and Sharyn Smith, founder of word of mouth agency Soup. The session is being curated and chaired by Launch Group CEO Fleur Brown. Also on the panel will be interactive strategist Michael Sinclair from Razor Media and sister agency US Sydney. The session will examine how brands can tap into connected consumers and turn loyal customers into their own sales force. It will also discuss the rise of social commerce, share tips and case studies on consumer co-creation plus offer insights into effective ways of driving word of mouth. Rossier is Kimberly-Clark Australia’s marketing manager. She joined the organisation in January to manage Kleenex Cottonelle. She has previously worked at FMCGs including SC Johnson, Reckitt Benckiser, George Weston and Nestle. She will share insights from the Kleenex Cottonelle Pinterest campaign – Australia’s first home-grown Pinterest brand campaign. Cooke is MD and Group CEO of online travel brand Wotif. Campbell is founder & CEO of Posse.com, a marketing platform which rewards and incentivises customers. Sinclair previously worked at award-winning creative shop, Wieden + Kennedy. Smith is founder & CEO of Soup which has worked with companies including Reckitt Benckiser, Lion Nathan, Coca-Cola and the Commonwealth Bank. Mumbrella360 takes place on June 6 and 7 at the Hilton Hotel in Sydney. Early bird tickets – with a $600 discount – are available on the Mumbrella360 website until the end of next week. 12th April 2012: The Noffs Foundation has revealed the majority of teenagers it treats for drug and alcohol use are also suffering mental health issues, with an increasing number turning to alcohol and contemplating suicide. The findings from the Noffs Foundation’s residential Program for Adolescent Life Management (PALM)* in Sydney and Canberra, reveal that three out of four (74.15%) young people at PALM either currently or have previously experienced some form of mental health issues. Worryingly, over one in three (34.7%) have attempted suicide – a marked increase from 25.4% in the same 2011 period. Noffs Foundation spokesman Matt Noffs said: “What’s quite concerning is that the number of young people we treat suffering from mental health issues has remained consistently high over the last couple of years. On top of this, more teens who are coming to us have suffered so much in their short lives, they’ve attempted to end it. Further findings reveal that trauma continues to be highly prevalent among young people, with physical assault by a known perpetrator being the most common (49.7%). While the primary drug of concern among youth seeking treatment at PALM is cannabis (58.5%), followed by amphetamine (19.73%), alcohol abuse has risen from 13.9% in the nine months to the end of March 2011, to 16.3% in the same period to March 2012. Matt said: “The majority of young people we see have yet to complete year 10 and they’re already at a dangerous crossroad in their lives. The work we do with them isn’t just about eliminating drug use, but providing vulnerable young people who have gone through trauma with the right support to put them back on track to reach their full potential in life. Matt adds: “This National Youth Week we celebrate the contribution young people make in our communities and our families. What they need is the opportunity to deal with the various issues they’ve encountered in their lives, in a supportive and caring environment. This can only be done with enlightened and powerful life changing approaches which the Noffs Foundation specialises in. *The findings above are from the Noffs Foundation’s Program for Adolescent Life Management (PALM) which is located in Sydney and Canberra. Using Noffs’ proprietary data collection technology, TED, the findings were collected between 1 July 2011 to 31 March 2012, involving 147 young people who have sought treatment at PALM. Where period-on-period comparisons have been made, they have been between 1 July 2010 to 31 March 2011 vs. 1 July 2011 to 31 March 2012. PALM is a residential program for young people aged 14-18 with serious alcohol, or other drug-related difficulties. The up to three-month program (with up to 12 months continuing care) aims to help young people to build the skills to manage their own lives effectively. PALM is based on leading research conducted in partnership with the National Drug and Alcohol Research Centre (NDARC). PALM provides a safe, homely environment within which young people are supported through this difficult journey. The program addresses the needs of young people at all levels including personal, social, vocational or educational, living skills and sport and recreation.